ST. JAMES—Manufacturing is a $30 billion industry in Missouri, and manufacturers are in need of employees throughout the state and in the Meramec Region, Alan Galindo of the Central Workforce Development Board (CWDB) told the Meramec Regional Planning Commission (MRPC) during its Aug. 9 meeting. To encourage young workers to consider a career in manufacturing and showcase what manufacturing is today, several companies around the state and some in the Meramec Region will be participating in National Manufacturing Day. 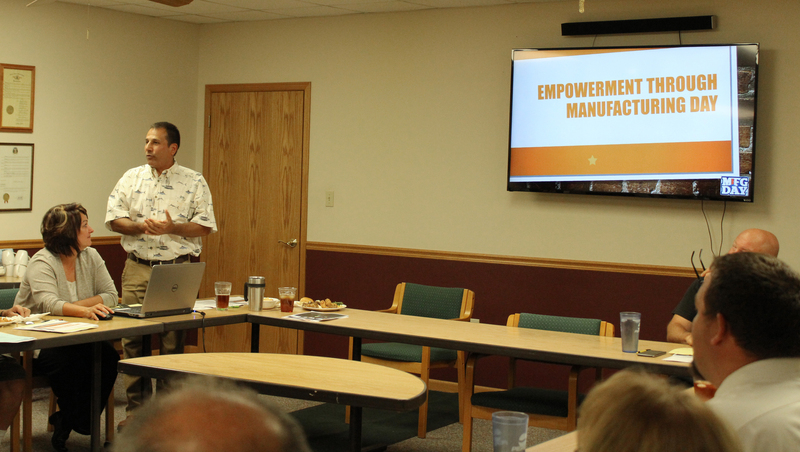 Galindo shared that manufacturers from Cuba, Owensville and St. James will be hosting tours and celebrations in conjunction with Manufacturing Davy in October. Manufacturers and economic developers are working in conjunction with CWDB to plan these events, and some will include tours by area high schools. Currently manufacturers make up 11.3 percent of the state’s private sector employment – 263,314 jobs across 6,491 establishments according to the Missouri economy brief on manufacturing. In the Meramec Region, Crawford, Gasconade, Maries and Osage counties all have higher levels of employment in manufacturing than the national average. For more information on Manufacturing Day celebrations planned across the region, contact Alan Galindo at CWDB in Rolla at 573-426-2946 or email alan.galindo@cwib.us. • Selected new chair and vice-chair for the operations committee. Steve Vogt representing Belle was elected chair and Mayor of St. Robert George Lauritson was elected vice-chair. Officers on the other two committees remained the same with external relations chair Dent County Presiding Commissioner Darryl Skiles and vice-chair Don Brackhahn representing seniors on the board and planning committee chair Mayor of Potosi T.R. Dudley and vice-chair Mayor of St. James Jim White. Formed in 1969, MRPC is a voluntary council of governments serving Crawford, Dent, Gasconade, Maries, Osage, Phelps, Pulaski and Washington counties and their respective cities. Washington County Presiding Commissioner Marvin Wright serves as chairman. A professional staff of 23, offers technical assistance and services, such as grant preparation and administration, housing assistance, transportation planning, environmental planning, ordinance codification, business loans and other services to member communities.